First launched for a specific customer – which has seen CO2 emissions from employees’ cars fall by up to 40% as a result – the service is now open to all fleets. It works as a bolt-on to a customer’s salary sacrifice scheme to enable staff to take an electric car with the added flexibility of a few days’ rental of a diesel built into their contract. It means that the vast majority of employees can now opt for an electric car for the main vehicle, safe in the knowledge that they have ad-hoc back-up as required. Research carried out by the firm has found that some 92% of respondents would consider an electric car but are nervous about relying on one for 365 days a year. The same survey found that the average commute driven was just 7.6 miles, with most employees covering around 200 miles a week and only venturing further during a total of five weeks a year; ensuring that EVs can fit most of their requirements, helped by rapid advances in ranges and charging. Customers can also help solve any charging infrastructure issues thanks to Fleet Evolution’s offer of free workplace charge points for any company ordering three electric cars or more. 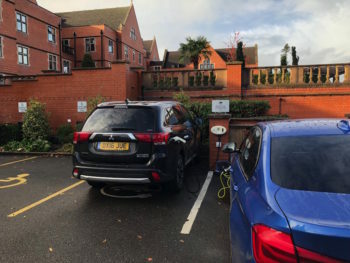 Commenting on the expansion of the Electric Flex scheme, Andrew Leech, Fleet Evolution managing director, said: “We already offer free charge points at work and home with our scheme but we want to remove all obstacles to electric car take up. Electric flex not only means employees can swap for a traditional car should the need arise but employees can also specify a larger car if they wish. Picture this: a customer needs a seven-seater for a two-week holiday to Cornwall? No problem. The employee just gives us a few hours’ notice and they can swap their electric car for a hire car of their choosing for that period; when you return, just swap back! “If life throws a last-minute party opportunity their way, they can take a car for the weekend with minimal notice, or even same day for overnight use! All this is bundled into their salary sacrifice. They just specify the amount of days and type of car needed, order, and we’ll handle the rest.